More and more homeowners today choose to sell their homes homes FSBO (For Sale By Owner) foregoing the help of a real estate agent. 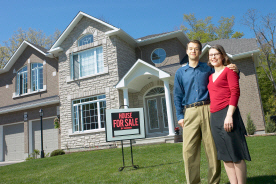 Selling your home by this method can save you a significant amount. (industry average is 6% of the home’s sale price). And many FSBO sellers like having more control in the process. You no doubt know our local market has changed significantly since 2005, versus the previous 3-4 years of huge value increases. A "Seller's Market" has changed swiftly to the opposite. You need to be informed, educated and focused, whether using a realtor or selling / buying on your own. We can help. There is also a selling agent; this can be the same person, or another (even you! )who brings the buyer. In the "boom" market we've just experienced, home demand outpaced supply - values increased rapidly, with short market time. Homes were easy to sell - even for new agents; it was not "about" agents' talent or skill as a rule. That said, we recommend you interview & hire experienced agents, on either side. It makes sense that experienced people with a history of performance would do a better job -take personal considerations out of the equation. (friends don't charge friends 3% for listing alone - if they Market your home effectively, they'll find the buyer and get That 3%) Remember, buyers have the advantage now - sell smart if you can. *Because: 3,600 homes were listed for sale in our local MLS in April 2006, while only 600 were sold/closed. Most realtors are unaware of that crucial data. Why? 85% of realtors, mortgage brokers & appraisers in SE Florida have only worked in the extremely unique "boom market" of the past few years. They simply don't Know a Normal market, as experienced people who've "been here"
You need to be sure your home is marketed properly, at the right price, whether you use a realtor, or "go FSBO". Many of the assumptions most homeowners make (realtors know value, you need a listing agent) are not valid. Experienced Appraisers know value, and provide you with the most vital & reliable service in the home sale or purchase process, for a fraction of realtor & mortgage fees. Buyers are well-advised to be sure they don't overpay now. A few hundred for an independent, experienced appraiser is a bargain in any market, saving buyers & sellers thousands in the process of making very important financial decisions better. According to the National Association of Realtors, over 70% of all homebuyers now use the Internet to search for homes - if yours isn’t on the internet, it should be. And that’s where we can help. Using my websites’ Online Property Presentation feature, I can provide you with a great marketing tool to get your home on the web in front of potential buyers, at a very reasonable cost.